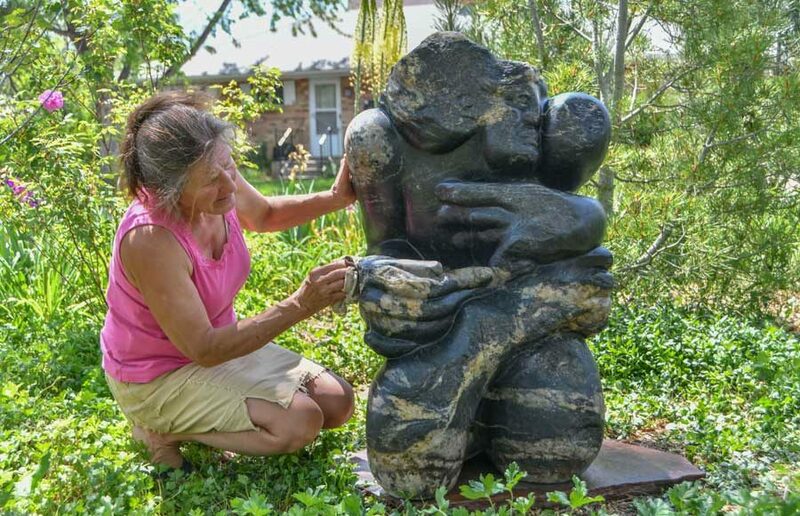 Macarus sculpts rock and stone full time at her home studio in Lafayette. Kimmerjae Macarus grew up knowing she wanted to become an artist. 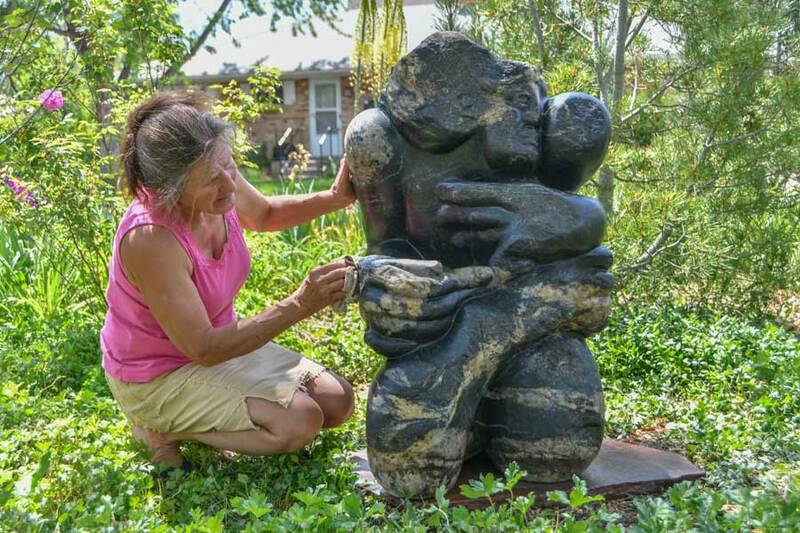 She earned a BFA with honors in sculpture and worked on a few commission pieces after graduation, but eventually decided that she didn’t have “the personality for the gallery world.” She still wanted to harness her creativity, though, so she studied to be a landscape designer and enjoyed that career for years. One day, while working with stones to create walls and a patio in a client’s yard, she was overcome with the urge to carve a piece of marble—even though her previous sculpting experience was mostly with clay and bronze. Macarus has given up landscape design (except for a few clients who are also friends) and now sculpts rock and stone full time at her home studio in Lafayette. 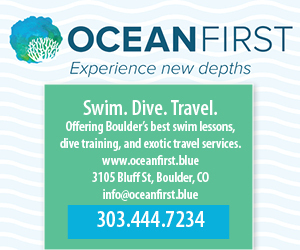 Her works are on permanent or temporary public display in a number of area cities, including a new permanent piece in Lafayette’s Festival Plaza—a climbable sculpture called “Boat of the Universe,” made of Colorado glacier granite—and a work sculpted out of Colorado gneiss called “Holds Water: Kneeling Rock for Standing Rock,” on loan for a year to Longmont’s Art in Public Places. Really getting to know the stone first is crucial, she explains, and she learned this the hard way while working on a commission piece, “Windhorse,” on private property in Niwot. Before she even touched a tool to the gargantuan, 9-foot chunk of basalt, she asked her client, “What do you like about horses?” and the answer was simple: “Everything.” With no real direction, she tried roughing out the piece, thinking she’d eventually find the inspiration she desperately wanted, but sharp shards of basalt were just flying all over, making her fingers bleed. She realized she needed more information, so she sat down with her client to discuss horses in detail. Last fall, wanting to shake up her creative process, Macarus committed to carving a different type of stone each week for 12 weeks, recording her sessions for her audience on YouTube. The 12 pieces that were a result of that endeavor will be on display Nov. 5 to Dec. 17 at Lafayette’s Collective Community Arts Center during an exhibit called “elemental journeys,” which also features Arabella Tattershall’s metal sculptures and Lynn Wooton’s oil paintings. Macarus says she’s grateful every day that she was able to finally “come back home” to sculpting.